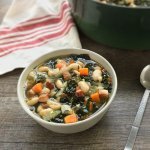 This White Bean and Kale Soup is so easy to make and can be on your dinner table in about forty-five minutes! Salty pancetta adds a bunch of flavor, and canned beans help make this a super easy weeknight meal. I’m not a fan of raw kale in salads, but I love it in soup recipes. This dish takes advantage of canned beans, which cuts down the cooking time dramatically. Cannellini beans are white kidney beans, and I’m a huge fan of them. I enjoy them in all kinds of recipes. They are delicious in my White Bean and Tuna Salad and in soups. I used about six ounces of pancetta in this White Bean and Kale Soup, but you can use less if you prefer. Or, if you prefer to use bacon, you can dice it up and use it instead. Also, if you happen to have a parmesan rind on hand, you can add it to the soup with the beans and other ingredients. It’s amazing how much flavor it adds to the soup. Some stores even sell containers of just the Parmigiano-Reggiano rinds now in the cheese department. I know I’ve seen them at Whole Foods before. I served some freshly made Skillet Cornbread with this White Bean Soup with Kale. You could serve yours with some crusty bread if you prefer. *It will look like a ton of kale when you add it to the pot, but it will wilt down as it cooks. 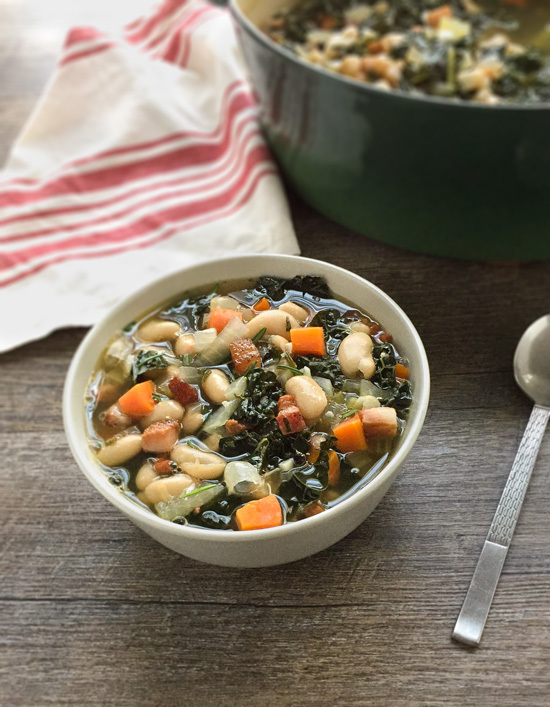 Salty pancetta adds a ton of flavor to this delicious White Bean and Kale Soup! Canned beans are the key to getting this on the dinner table quickly. In a 5-quart dutch oven or soup pot, heat the oil over medium heat. Add pancetta and cook, stirring occasionally, until golden brown. Remove from pot with a slotted spoon and place onto paper towel-lined plate. Discard all but 2 tablespoons of grease. Add the onions, carrots and celery to the pot, and let cook, stirring occasionally, until softened, about 5 minutes. Add the garlic and cook for a minute more. Stir in the chicken stock, water, beans, pancetta, dried thyme and kale. Bring to a boil, reduce heat and let simmer until kale is tender, about twenty minutes. Add fresh rosemary, sea salt and pepper to taste, then serve. If you happen to have a parmesan rind on hand, you can add it to the soup along with the beans and rest of ingredients.